Lay off the cheese burgers, son. THE MEMPHIS GRIZZLIES have the best record in the NBA at 15-2. We’d say they’re the NBA’s biggest surprise through the first four weeks of the season, but the thing about the Grizzlies is that they’re never surprising. They’ve had the same core of players for years. They aren’t going to shoot a bunch of 3-pointers or push the pace. They’re just going to beat teams with defense and physicality on the interior. At the end of the season they’re going to end up with somewhere around 50 wins, without fail. The difference this year is that Marc Gasol is playing on a different level, and a new diet may have a lot to do with it. Gasol, the Grizzliesâ&#128;&#153; center, had spent much of the summer in Spain cutting refined sugar, soda and processed foods from his diet; cutting back on carbohydrates and red meat; and adopting a mostly flexitarian, or semi-vegetarian, diet. Long-time Grizzlies teammate Mike Conley told the NYT that he barely recognized Marc and it looked like he lost 50 pounds when he watched him on TV in September. In 2012-13 he won Defensive Player of the Year. In 2013-14, the Grizzlies were 40-19 with him on the court and 10-13 during a two-month stretch when he went down injured. Memphis hasn’t finished outside the top-10 in defensive efficiency since 2009-10, Gasol’s second year in the league. All of that is to say he has been one of the best players in the NBA for the past three years — and in 2014-15 he has been even better. Gasol is having the best offensive season of his life. He’s averaging 20 points per game (he has never averaged more than 14 ppg in a season), getting to the free-throw line nearly twice as often as last year, and shooting his best percentage since 2010. His player efficiency rating (PER) is a career-high 23.6– which ranks 10th in the league. Not-so-coincidentally, Gasol got into the best shape of his life right before he becomes a free agent in June. He’s widely expected to get a max contract, and nearly a dozen NBA teams could have enough cap space to sign him. His free agency won’t be as hyped at LeBron’s in 2014 or Kevin Durant’s in 2016, but teams will be lining up to pay him maximum dollars — especially now that he has shown an ability to carry a team on the offensive end. 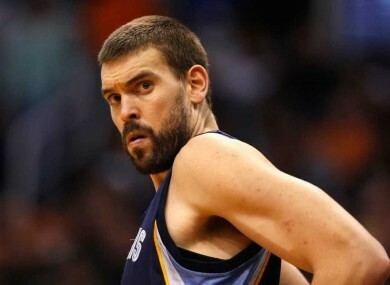 Email “Marc Gasol lost a ton of weight with a vegetarian diet before becoming the biggest free agent in the NBA”. Feedback on “Marc Gasol lost a ton of weight with a vegetarian diet before becoming the biggest free agent in the NBA”.